I like to broil zucchini instead of roasting or sautéing to avoid using a lot of oil and/or ending up with mushy zucchini. Broiled zucchini is very good with Vegan Tzatziki but goes with a lot of sauces too. With a substantial side dish, broiled zucchini with a sauce can serve as a wonderful low-calorie entree. Preheat broiler on high. Place a rack 3-4 inches from the broiler element. Trim the ends off the zucchini. Slice it diagonally into ½” oblong slices. Line a sheet pan or cookie sheet with foil. (Parchment paper can catch fire, and silicone mats may melt at this temperature.) Spray or brush the pan with oil. Lay the zucchini slices on the foil. Spray or brush with oil and season with salt and pepper and/or other spices (e.g., Montreal steak seasoning, Italian herbs). Broil the zucchini until it is brown on top (timing is extremely variable depending on the broiler—check after 4 minutes and go from there), then flip and broil until there are brown spots and it’s tender but not mushy. These fritters are very much like pakora appetizers at Indian restaurants. Baking them rather than deep-frying makes them a lot healthier. They’re substantial enough to serve as a main course or side dish. The zucchini. Trim and grate the zucchini. Move to a colander, sprinkle generously with salt and toss well, massaging the salt into the zucchini. The salt will be rinsed off later, so don’t worry. Leave the grated zucchini in the colander for 20 minutes, then rinse under cold water. Squeeze as much water out as you can, then spread out on a clean dish towel. Cover with another clean dish towel and press or roll, getting the zucchini as dry as you can. The onion mixture. In a microwave-safe dish, microwave the following ingredients until the onion is transparent and soft, about 4-6 minutes. The “egg”. Blend the following ingredients together with an immersion blender in a smallish container (e.g., a two-cup measure). Blend on high until the mixture is thick, about a minute. Flour and assembly. Whisk together the following ingredients ina medium-large bowl. Add in the zucchini, “egg,” and onion mixture and stir until well blended. There should be no more flour showing and you should have a thick mixture. Line two sheet pans with parchment paper. Drop scant 1/4 cups of the mixture onto the sheet. Press down lightly. Bake for about 25 minutes or until fully cooked with definite golden or brown edges. Serve with chutney, such as my Mint Cilantro Chutney. This chutney is super-flavorful. 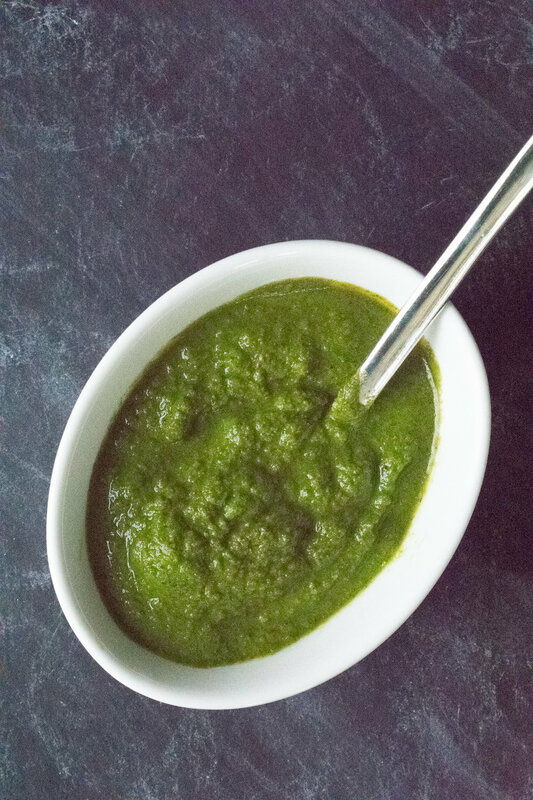 Packed with cilantro and mint, it makes a big impact on breads, appetizers, roasted vegetables, or just spooned out of the container into your mouth! It has a great sweet-sour thing going on with the dates and onions. You can control the spiciness with the number of peppers and whether you de-seed and de-vein them. In a food processor or blender, add these and combine into a paste. Transfer to a container and refrigerate until ready to serve. Mushrooms and ricotta cheese couldn’t be more complementary: earthy vs. sharp, chewy vs. creamy, brown vs. white. Throw in tomatoes and Italian spices, and you’ve got a delicious party going on inside the folded-over pizza crust. If you have a pizza stone, put it in the oven, preheat the oven to 500°, and let it heat 30 minutes after it hits 500°. If you do not have a pizza stone, preheat the oven to 475°. The dough. You’ll need one pound of pizza dough, thawed. Most supermarkets sell one-pound slabs of dough. I have not found one that is oil-free. If you want to make your own, note that recipes with around 2 cups of flour make about a pound of dough. The filling. Water-sauté these ingredients in a large skillet over low-medium heat until the liquid released by the mushrooms is evaporated and the mushrooms start to brown, 8-10 minutes. Turn off the heat and stir in the following ingredients. Divide the pizza dough in half. 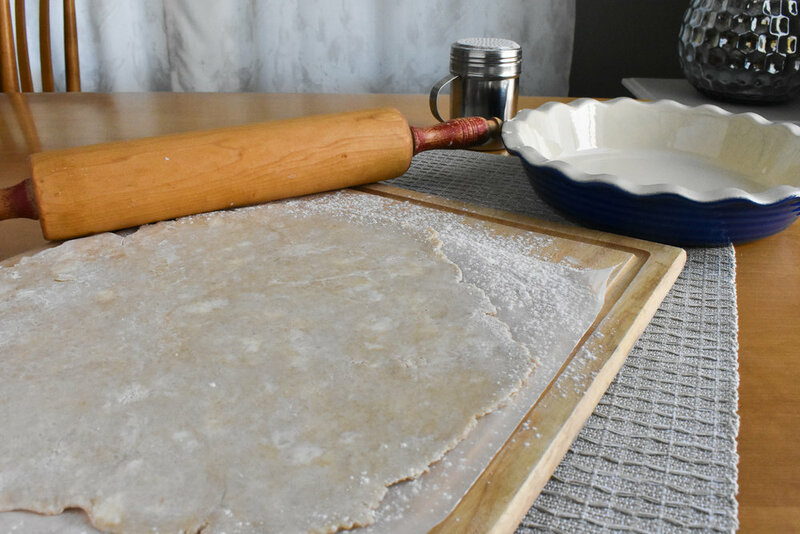 Stretch out the first piece with your hands (or a rolling pin) into a ¼” thick round (10-12”). Put half the filling in the center of the dough. Fold the round in half over the filling. Press or crimp the edges of the dough to seal the calzone. Repeat with the second piece of dough and remaining filling. 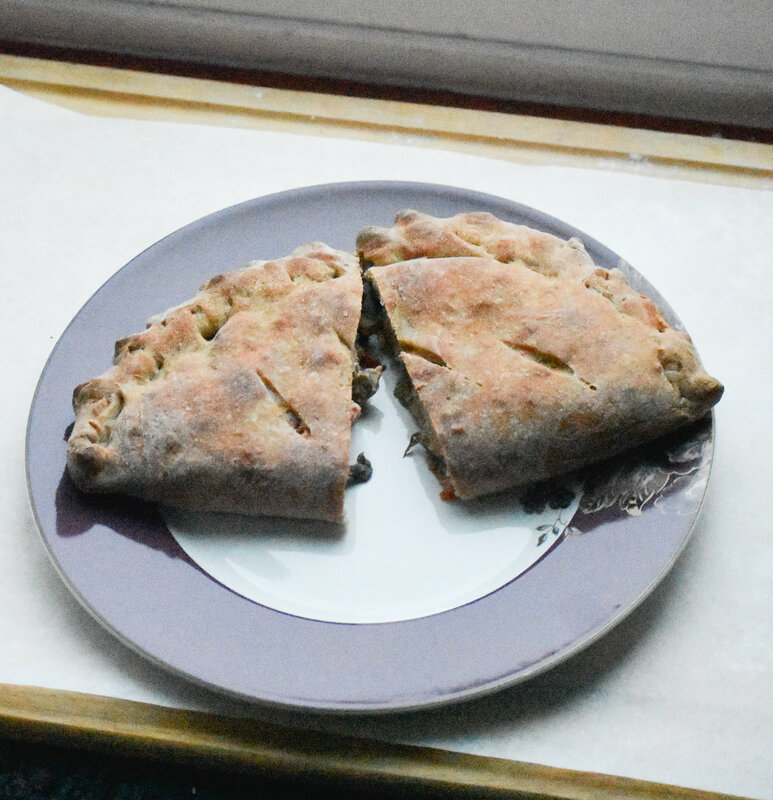 Cut a few small vents in the top of the calzones to let steam escape. Put the calzones directly on the pizza stone and bake for 12-15 minutes until browned. If you are not using a stone, put them on a sheet pan lined with parchment paper and bake at 475°for 16 to 18 minutes or more, until browned. Let them stand for at least 5 minutes before serving. While the calzones bake, in the pan used to cook the mushrooms, combine the following and cook at low-medium heat for 5-6 minutes. Serve alongside the calzones for topping or dipping. My husband is picky about texture. 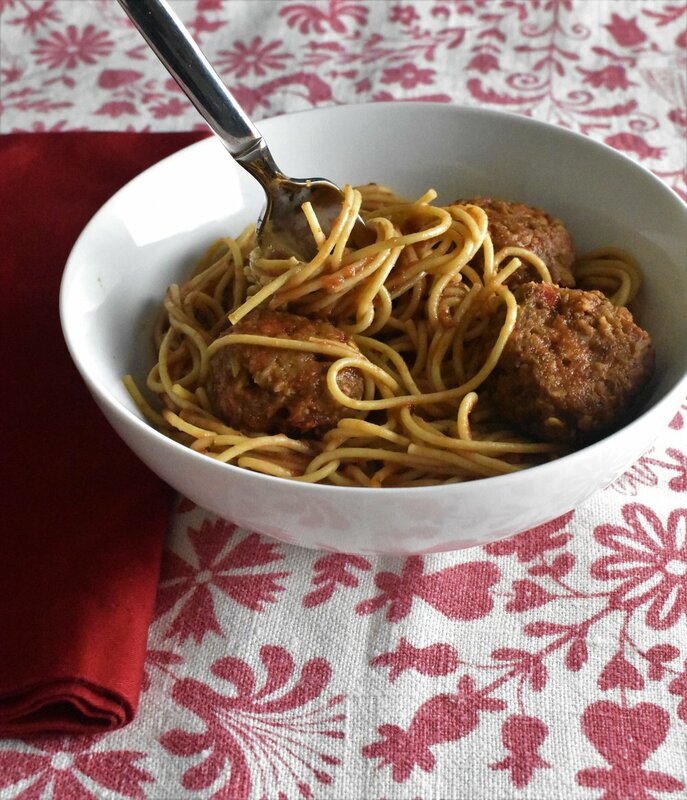 I have been through a lot of vegan meatball recipes. I kept tweaking this recipe once I was on the right track, and the finished result is here. These are great with spaghetti and marinara or with whatever sauce you fancy. They also have 15 grams of protein per serving and freeze well. Sauté the peppers and onion in a skillet with water (start with ¼ cup water) for 5-10 minutes, until the onions are transparent and soft and the pan is dry. (Do not microwave, because that results in too much moisture.) Set aside. Place the following ingredients in a food processor and pulse a few times until well combined. Combine this mixture with the pepper and onions and mix them with your hands for a few minutes to activate the gluten’s elasticity. Line baking sheet with parchment paper. Make 16 ping-pong-ball-size meatballs. Place on the baking sheet and bake for 15 minutes. Turn them over and cook for another 15 minutes or more until they are a full shade darker with some parts nicely browned. Serve with Gracious Vegan Marinara Sauce or whatever sauce you like, and your choice of pasta. You don’t have to tell people there’s tofu in this lasagna unless they insist on knowing. My guess is that they will not care what’s in it. They’ll only want to know if there’s more. Multiply the recipe by 1.5 if you want to use a 9” x 13” pan. This freezes well. Thaw the package of spinach by leaving it out for a few hours or by microwaving it for a few minutes. Let it cool a bit then squeeze out the water well. Noodles. Cook lasagna noodles according to package directions. Vegetables. Microwave or water-sauté the following vegetables until they are fully cooked. Drain away any excess moisture. Tomato sauce. Use Gracious Vegan Marinara Sauce or your favorite (you’ll need about 4 cups). “Ricotta.” In a blender or food processor, process the following ingredients until smooth. The cashews may not get 100% smooth, but that’s okay. Stir the thawed, squeezed spinach into the ricotta mixture separately. Assembly. In a baking dish (9” x 9” or 7” x 10”), pour in about a cup of sauce to cover the bottom. Layer 3 lasagna noodles (fold or tear them if necessary). Top with a third of the ricotta mixture. Top with a third of the mushroom-vegetable mixture. Repeat 1 cup sauce – 3 noodles – 1/3 ricotta – 1/3 vegetables two more times. End with the final cup of sauce. Top with breadcrumb mixture. Bake uncovered for 50 minutes. Let sit about 5 minutes before serving. Hard to believe that you can have eggplant parmigiana with virtually no oil. No breading, no frying. Just broiling the eggplant slices releases their flavor, caramelizes them, and keeps the dish clean tasting. 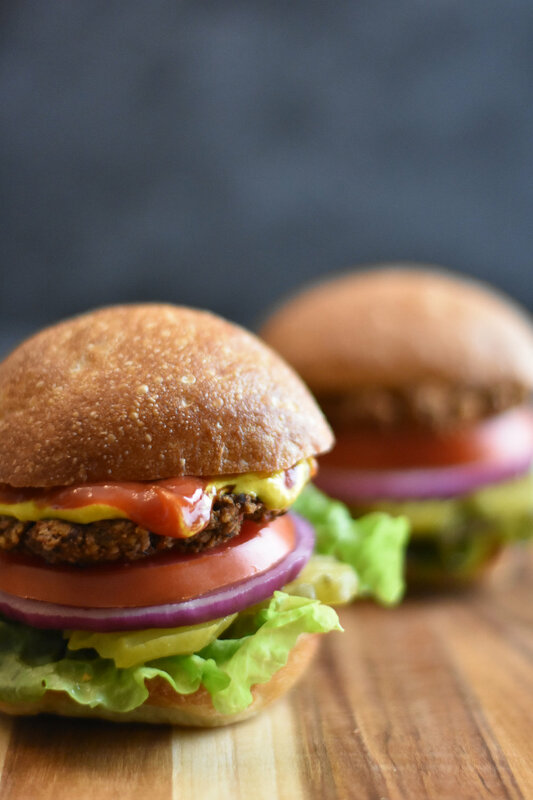 Vegan parmesan means you can also avoid heavy dairy. 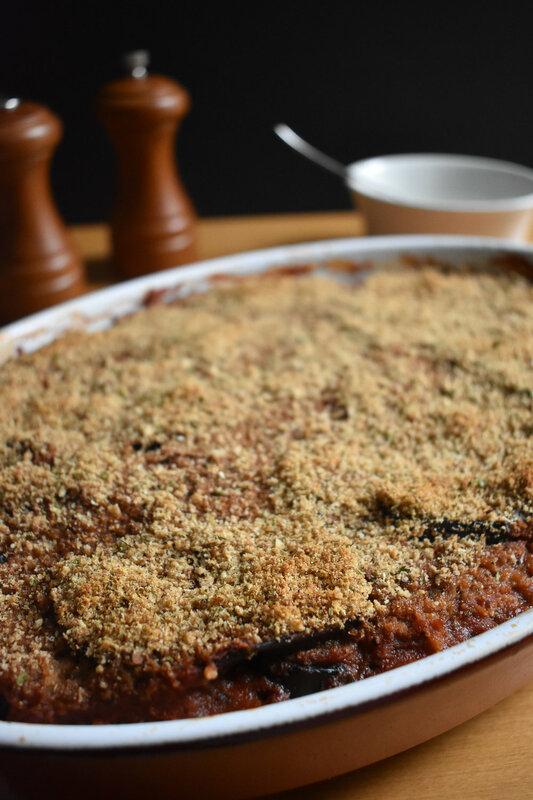 Light and delicious, this Parmigiana will please the eggplant lovers among us. This dish freezes well. Eggplant. Turn on broiler to high (500°). Line a baking sheet with foil, spray it with oil, and fit as many slices as you can in a single layer on the foil. Spray the top of the slices with a little oil. (They get tough and dry if you don’t use any oil.) Broil 3-4” from the element until the tops are brown to dark-brown, about 4-5 minutes. Then flip them and broil until the other sides are browned, about 3-4 minutes. Repeat for remaining slices. Set aside and change the oven to bake mode at 375°. Sauce. In the meantime, water-sauté the aromatics in a Dutch oven or large skillet with ¼ cup water until onion is translucent, around 5 minutes. Add tomatoes and oregano, breaking up any whole tomatoes. Cover and simmer 15-20 minutes. Add and stir these in to finish the sauce. Use a 9” x 9” square or an oval (12” x 8” or so) baking dish. Spread thin layer of tomato sauce in the bottom of the pan, then add a thin scattering of vegan parmesan. Then create a single layer of eggplant. Repeat until all ingredients are used, ending with a little sauce and a sprinkling of parmesan. Sprinkle the bread crumbs on top. Bake at 375°until the mixture is bubbly, at least 35 minutes and maybe more. Remove from the oven and allow it to rest for 5 minutes before serving. This creamy concoction tastes excellent and a lot like ricotta cheese. Some of us would say better than dairy ricotta. It works well on pizzas, in calzones, in lasagna, and in many other recipes. Drain cashews and place them with remaining ingredients into a blender or food processor, and process until creamy. (I find that the food processor is better than a blender for this recipe, even a high-speed blender.) You might have to stop and scrape down the sides once or more. Taste for flavors. Cover and chill in the refrigerator for an hour or two, to stiffen the cheese. 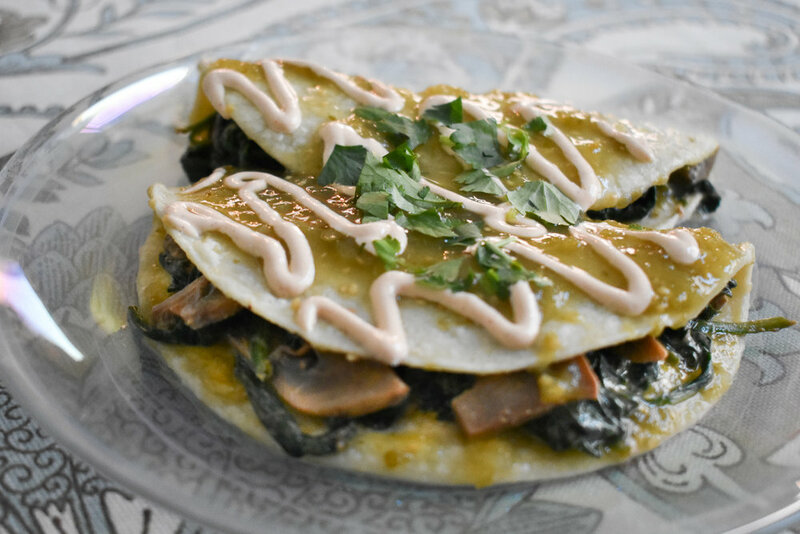 Baking enchiladas has its drawbacks—they can dry out, merge together, and the tortillas can get too saturated. These verde enchiladas are easy and quick—they’re folded rather than rolled and then go right onto the plates. They keep their shape, look fantastic, and taste divine. Start the vegan crema if you choose to use it (Gracious Vegan Crema). Sauté these ingredients in a large skillet with a Tablespoon or two of water, stirring frequently, until the liquid released by the mushrooms is almost evaporated and vegetables are soft, about 8 minutes. Add spinach and salt and cook for 2-3 minutes, stirring frequently, until spinach is reduced and soft. Drain mixture if there is excess liquid and cook a bit longer to make sure the mixture is dry. Then add the crema and stir it in. Set aside. Unless you have several large skillets, you may need to move the filling to a bowl and clean the large skillet for the final step. Heat 1.5 cups of the salsa in a small-medium skillet over low heat. 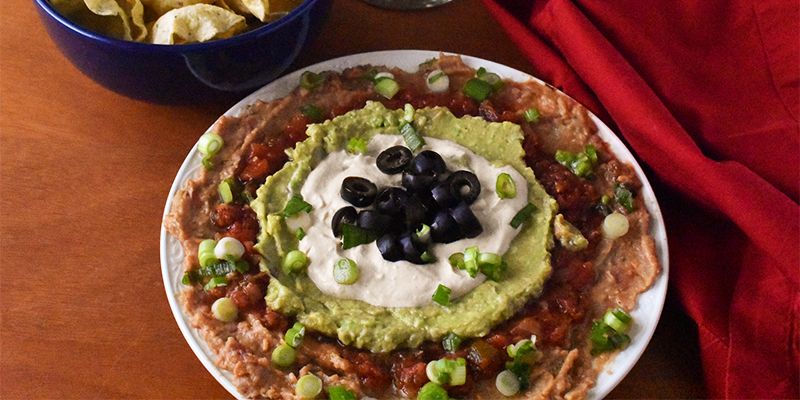 Dredge both sides of each tortilla in the warm salsa using tongs, and stack the tortillas on a plate. This dish approaches the texture of a creamy korma. The spicing is simple, but the result is wonderful. The fenugreek spice is important to the flavor of this dish, so go online or to a local Asian market. Soak cashews in cold water at least 2 hours, or pour boiling water over them, cover, and let them soak 20 minutes while you start the rest of the recipe. Water-sauté these ingredients in a Dutch oven until the liquid released by the mushrooms is evaporated and the mushrooms start to brown, 8-10 minutes. Add the spices and stir 1-2 minutes. Add the diced green chili pepper and cook 1-2 minutes. Separately, drain the cashews and place them in a blender with water 1 cup water and process until absolutely smooth and creamy. Then add tomato paste to the blender and blend it with the cashew cream. Add the cashew-tomato mixture to the Dutch oven along with the peas, salt, and additional water. Cover and simmer for 5 minutes. Add additional water to achieve a desired sauce consistency. Garnish with cilantro and serve over rice, other cooked grains, or with flatbread. I wanted to show people that vegan food could go upscale. This elegant presentation is matched by the scrumptious flavors. 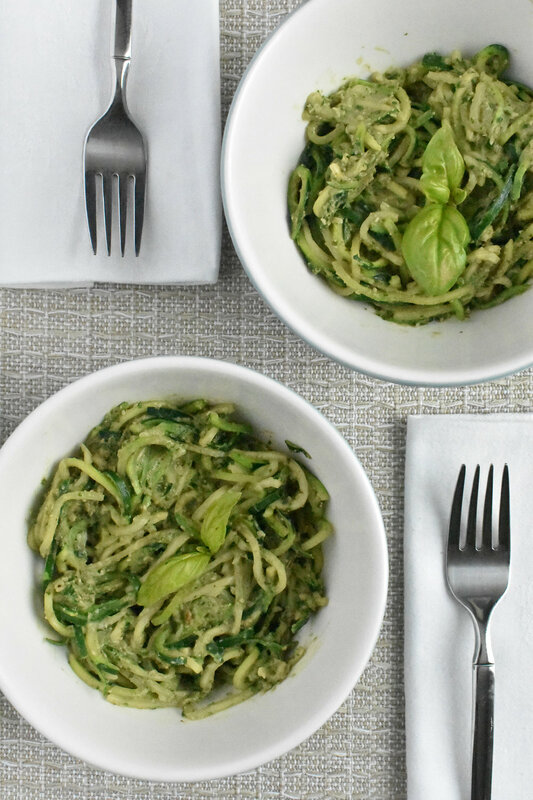 The pesto-based vegetable mixture inside the pasta shells offers a pleasant surprise if you don't know what's coming (and even if you do). The pan sauce adds a savory goodness with a hint of wine. 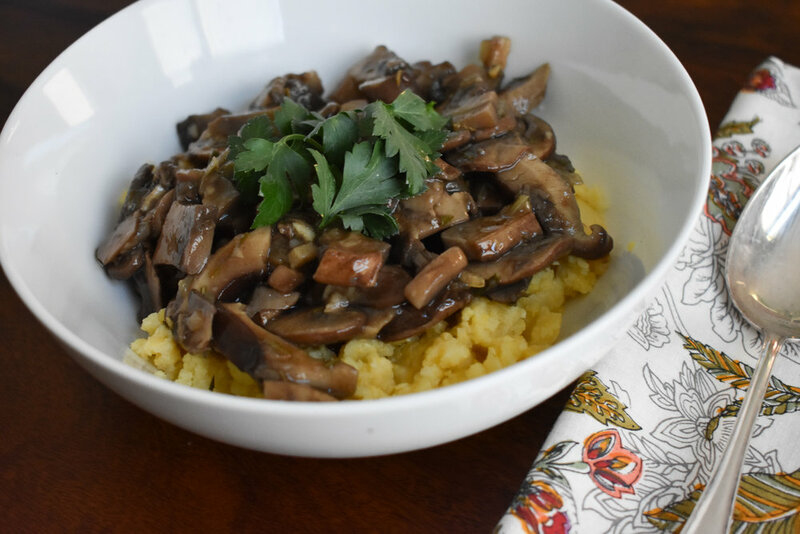 This recipe can be easily multiplied to serve more people--I set up this recipe for a romantic dinner for two. Note in the picture that I served this with Brussels Sprouts with Hazelnut Butter. A lovely combination. Preheat oven to 375°F and start the pasta water boiling. When the oven is hot, toast the pine nuts for about 6 minutes (until just golden) and the breadcrumbs about 8 minutes, until golden. Leave the oven on after you take them out. Meanwhile, boil the pasta shells for about 10 minutes – until al dente, but not too firm. Drain. Separately, cook the following vegetables in the microwave (or water-sauté on the stove) until the vegetables are soft, about 3-4 minutes. Drain off any extra water. 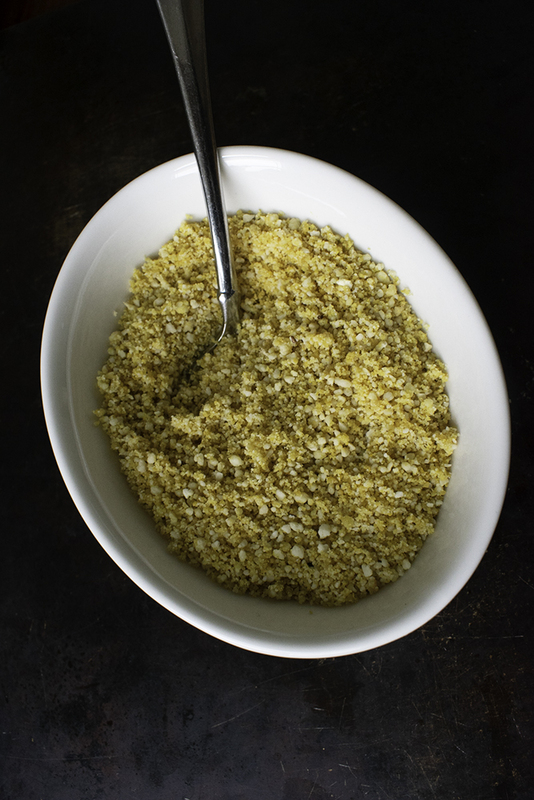 To start the pesto, mince the garlic in a food processor. Add the following and process into a paste. Add tofu and process for a few seconds to mix it in. Stuff the mixture into the 8 cooked shells. Transfer the shells to a baking dish, pour vegetable stock into the bottom of the dish, cover tightly with foil, and put in the oven for 15-20 minutes. While the shells are baking, make a pan sauce. Sauté shallot in vegan butter in a medium skillet over medium heat, stirring frequently, until the shallot is softened and starting to turn golden, 2 to 3 minutes. Add vermouth or wine and boil rapidly until pan is almost dry, about 3 minutes. Add broth and boil rapidly, 4-5 minutes, until there is about ½ cup of liquid left. Pre-blend the cornstarch and the water, then whisk the following ingredients into the skillet and bring to a boil while whisking. The sauce should come together in about 30 seconds. If the sauce is too thick, add more broth, water, or nondairy milk. When you are ready to serve, ladle a bit of sauce onto each plate, place the shells on top, then spoon on more sauce and top with breadcrumbs.